Your code of conduct has to be relevant and relatable to a whole new generation of employees. The old three-ring binder on the shelf or an email link to a pdf file won’t cut it anymore. For your code to truly define and inspire the right behavior, it has to engage employees in all geographies and promote real interaction. Codes of conduct that are delivered through modern communication methods that allow the user to engage, interact, and research further behind the Code into related policies, procedures, and helplines for additional guidance, can be better monitored and measured. The value behind a code of conduct is more than the satisfaction of a legal requirement. It can be the central hub of a well-thought out and supported capability for driving corporate values and expectations for conduct into the fabric of the company culture. 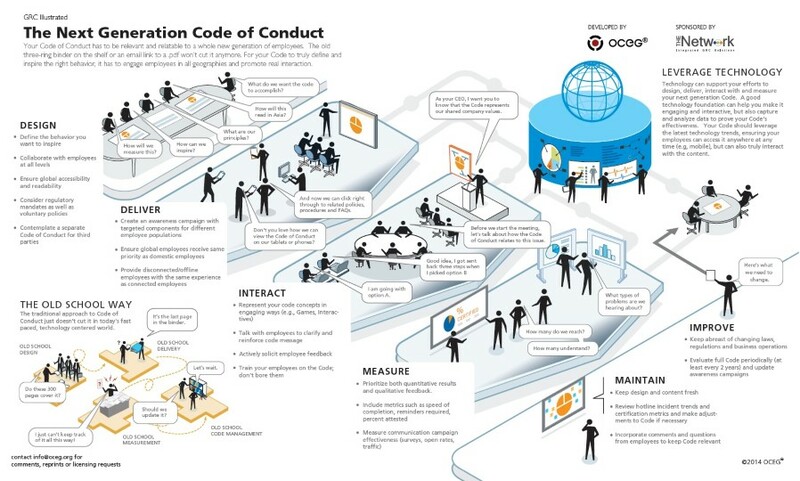 Use this illustration to design a code of conduct system that truly can be measured for effectiveness. Developed by OCEG with contributions from The Network. We have emailed instructions to access Illustration – The Next Generation Code of Conduct to . Make sure the email arrives in your inbox: either add "support@oceg.org" as a safe sender to your email platform, or if you use Gmail, drag our email into your Primary tab.